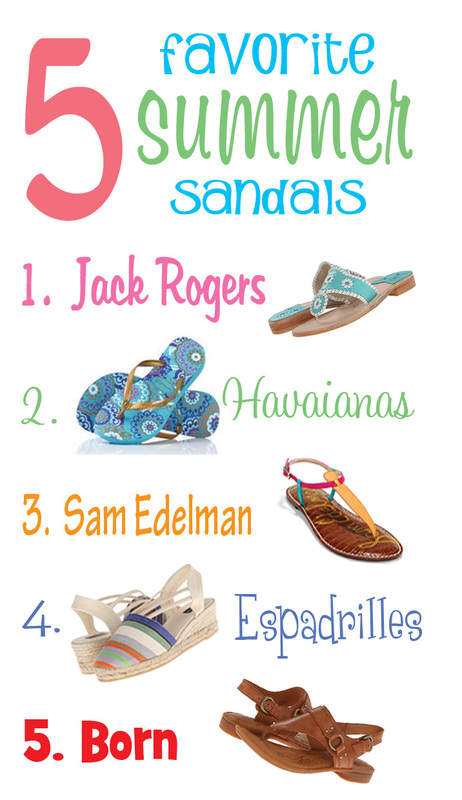 Jack Rogers; http://www.jackrogersusa.com; these are my all time favorite summer sandals. They come in a variety of colors, and are also available in wedges. Prices range from $110-$128. They also offer jelly beach sandals for $68. I’ve owned many of these, and they last a super long time. They’re also really comfortable after you break them in! Havaianas; www.havaianas.com; these are simply the best flip-flops all around. They also come in a variety of colors and patterns. Prices range from $26-$32. They also come in wedges and new t-sandal styles. If you’re undecided, you can design your own Havaiana on their website! Sam Edelman; www.samedelman.com; Gigi style, comes in various color combinations, $65. These are very comfortable and you can match them to almost any summertime outfit. Espadrilles; www.zappos.com; Sesto Meucci style, $65.99. Who doesn’t love espadrilles in the summer? I often buy mine in Spain or Italy, but Zappos offers tons of styles of espadrilles, in all colors, prices and styles! Born; http://www.bornshoes.com; Neeli style, $85. While at first glance Born shoes may not always appear the most fashionable, they are definitely very comfortable. These are the best type of sandals to take on vacations where you’ll be walking a lot! Trust me, they come in very handy. What are your favorite summer sandals? « What Is A Montadito? I like all of the choices you picked. I find myself in flip flops more than anything because I am always chacing after the kids and they are the most comfortable. Those are all so cute! But I think I’m loving the Havaianas & Born sandals the best. You can never have to many sandals, those are all adorable! I like the choices you have here.as soon as we get to around April all the way through to start of November I wear flip flops 90% of the time. I have always loved summer sandals. Unfortunately my Ortho doctor just told me I can no longer wear them. I am so bummed and will be stuck in sneakers for a while – stress fractures need extra support. Not a sandals-guy. but if you’re talking boat shoes then I’d be all over it! Now I just want to go shoe shopping. Lol. Great choices. those are super cute but can’t handle anything between my toes. I don’t like anything between my toes either! I live in my birkenstocks but really need a new pair this summer. I keep seeing those Jack Rogers but they are pricey. I may spring for a pair. Yes they are pricey but try to find them on Ebay…Older styles/colors are sometimes on sale if you can find your size, and trust me, they last a few summers! #3 and #5 have to be my fav on this list. I love sandals but I like the kind that feel secure on my feet because I am prone to accidents. #2 and 3 are my best ones 🙂 I used to be big on sandals, but lately not so much. I love the Jack Rogers shoes. So fun and looks comfy! Great color too! I love all those shoes. I am really all about sandals that are comfortable for my feet. Checkout Zappos.com they carry all types of espadrilles in all types of colors! My husband swears by Borne. He is always insisting that I get a pair, and really, I should. We do a lot of walking in the summer, and a comfy pair is definitely needed! I love summer sandals too, but prefer flip flops usually. My feet are so tiny I can usually wear a 5 but those are either not available or often already sold. I could also live in sandals. My favourites are my keens actually. They are very comfortable. Yes we’ve had those for trips also. What’s great about them is they can get wet too. Everything is really cute! A couple of these I have, and my Havaianas just broke. I’m so sad! I need to buy a new pair. I’ve always loved espadrilles because they are really comfortable. Also, they look really nice with a variety of outfits. I love sandals also, especially because I know I must maintain my pedicure and go weekly ;). My favorite is for sure Havianas so easy to slip on and they go with everything. Love the sandals! All are great choices, but my personal favorite is #2. I just got my first pair of Jacks! I have to say though that they don’t fit my feet right. I need to break them in. I love wearing sandals and wear them everyday until snowfall. Thanks for sharing these great brands. I will take a look for them when I am in the USA this week. The Sam Edelman’s are my fave, but these are all cute. My daughter loves her Havaianas. As I live in Trinidad, I pretty much wear sandals and flip flops 365 days in the year. I love my Havaianas…I have a few pairs. I like the ones your mentions but, I love flip flops. I’ve never heard of Havaianas. Those are really cute.